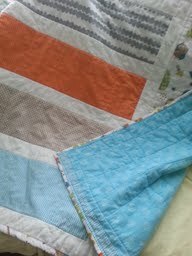 This is the Easy Baby Quilt, but tweeked a little to use colors I had on hand. Seriously, I spent most of Saturday sewing. 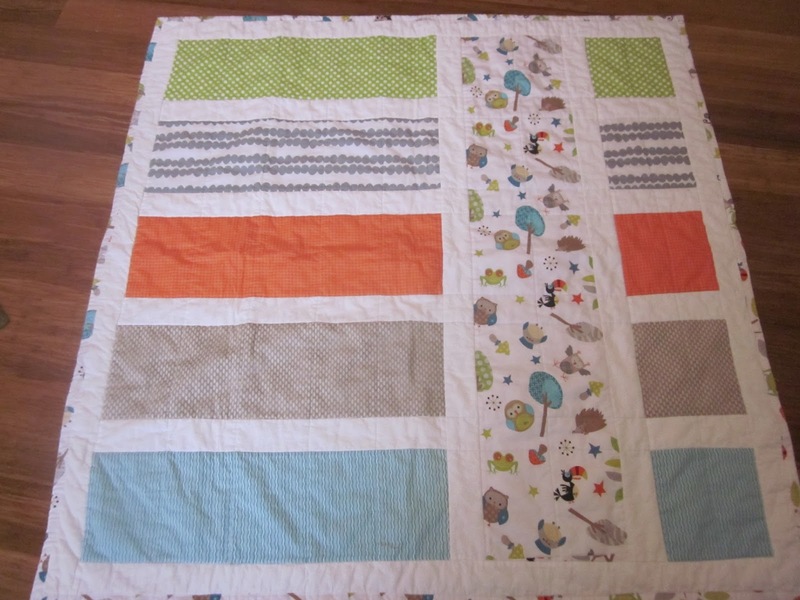 This delightful fabric is from the Riley Blake (Life in the Jungle) collection and the baby quilt is the same pattern used by Ray, Lo and me to make the "Easy Baby Quilt", with a few differences in measurements. The animal print was a remnant that I found at Pine Needles (one of my favorite quilt shops) and the other five pieces were fat quarters. Finished quilt measurements are about 42 x 46". DIRECTIONS: I cut the five horizontal fabrics 6 1/2" by the whole width and four strips of white 2 1/2" by the width. I sewed one color strip with a white. Then I cut them to the sizes. Which was 6 1/2 by 24 1/2", then 6 1/2 by 6 1/2". This saves some times. *******Make sure to press fabric and use spray starch before cutting! *******Make sure seam allowance is 1/4"
I used my walking foot to quilt and did four inch vertical lines, then I quilted horizontally in between prints and white lines. I wish I had stitched them closer together, but live and learn.